one man operation dedicated to the proper restoration of vintage military weapons of the 20th century. It is now a small operation consisting of a select group of experts led by the Master Refinisher Nick Kaikkonen. "I, like you, wanted my weapons to be as nice as possible without having to remortgage the house in order to buy that mint, unfired, perfect specimen. That meant restoring it, or having it restored by someone, other than me. After contacting a few gun shops, I quickly realized that not only there wasn't anyone exclusively repairing and rebuilding these classic guns, they didn't have a clue how to do it properly. Authentically. I soon realized all of the related, and sometimes necessary, skills such as machining, welding, metallurgy, heat treating, engraving, chemistry and woodworking were going to be needed. No matter how complex the restoration, how severe the damage, or how meticulous or detailed the repair must be, I meet the challenge with enthusiasm. Located just 20 miles from Detroit, this area is a Mecca for Technology. I'm backed up by a hand picked team of like-minded professionals who are the Who's Who of the tool, die and mould industries, which just happens to be manned by those very same craftsmen that I mentioned earlier. Tig welders, laser engravers, metallurgists, machinists, you name it. I can either do it, or have it done properly. Maybe your prized Garand or 1911 or '03 Springfield just needs a simple parkerizing job. That's certainly not a problem. Maybe your WWI Colt .45 needs a reblue. I can duplicate virtually any original military finish, whether it's manganese, zinc phosphate or black oxide. Dull or high polish finish, it doesn't matter. I can accurately refinish it. 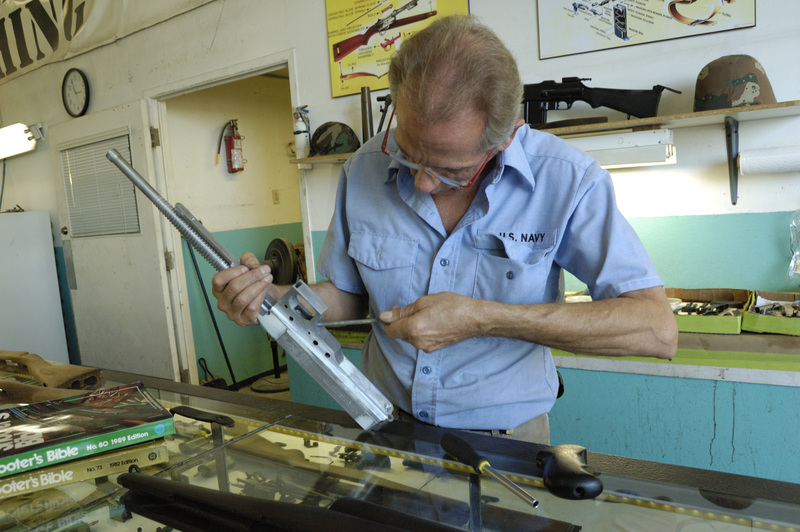 Whether it's a touch-up or a complete rebuild, Vulcan Gun Refinishing can meet your requirements. Re-barreling, headspacing, wood refinishing, even leather conditioning are everyday things here. Feel free to check out Youtube for some videos of past projects. You can always expect a quick turnaround time and fair prices. I can and will deliver whatever level of expertise you want. Guaranteed. Many references and reviews are available. Thanks for considering me to do this work for you."